What is a Weekend MBA Program? Weekend MBA programs are the perfect academic solution for busy adults who want to further their career by furthering their education. Research shows that part-time MBA degree’s definitely pay off, according to Forbes. Weekend MBA programs offer rigorous curricula, powerful learning experiences and plenty of creative collaborations among top students and organizations. These programs are identical to other MBA programs, because they have the same courses, faculty and educational requirements. These programs are designed for working professionals who want opportunities to maintain their careers while immersing themselves in intense academic experience. Because weekend MBA programs are designed for working professionals, students benefit from being able to apply what they learn in classrooms to their work environments and vice versa. Weekend MBA programs take two to three years to complete and offer four to six semesters per year. Some weekend programs are offered on Fridays and Saturdays, but most are on Saturdays and Sundays. Full-time weekend programs are full day, but other programs may only meet on one day or on both days for either morning or afternoon sessions. Students who wish to accelerate their progress are often allowed to take heavier course loads, attend summer classes or take a few classes online. Weekend MBA curriculums run on tight schedules with comprehensive content that covers all core topics. This includes classes on HR, finance, strategy, marketing, management and organizational behavior. Depending on the school, certain programs place particular emphasis on special topics, such as information technology, global management, innovative entrepreneurship and transformational leadership. A central component of all programs is applied projects that give students opportunities to apply newly acquired knowledge and methodologies. 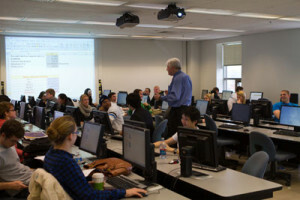 On either day, students will arrive and attend a two-hour class, such as global marketing or managerial accounting. After lunch, students will hear a guest speaker, either an expert or an executive, who will discuss important topics, like leadership integrity and corporate responsibility. In the afternoon, there will be another class, such as risk management or conflict resolution, and the day will end with a workshop or interactive lecture. Classes are designed to promote interaction with speakers who draw on various current events and education sources. MBA programs attract a wide range of diverse professionals with unique backgrounds and accomplishments. Because of this, most programs do not strict cut-off levels for grades, GPAs or GMAT scores. Instead, most programs have flexible eligibility requirements, such as allowing students to use work experience and employment based training in place of traditional admission requirements. Most programs require a GPA starting between 3.2 to 3.4 and a GMAT of 680. A similar score is used because approximately three-fourths of all students fall in the 620 to 740 score range. The average age of weekend MBA student’s is between 26 to 35 years old. These students usually have at least four to seven years of work experience. At least half of all students will commute from outside the city and even state. Related Resource: Distance Learning MBA. Weekend MBA programs are becoming more popular because students are able to maintain work, family and personal commitments while gaining a stellar education.